As spray paint, or 'rattle cans' go, modelers are presented with many options. Rattle cans also offer a lot of convenience that can move a model along to completion. But that convenience often brings downsides. Many brands of paint go on heavy and can obscure fine detail on your model's surface. Very often runs and puddles of paint can occur if you are not careful. And certain brands will craze plastic. I recently happened upon the Tamiya line of AS spray paints, and am pleased to report the results. At present, there are 64 colors available in the line, including clear. Each can contains 100ml of a quick-curing synthetic lacquer paint, slightly more than in Testors' rattle cans. 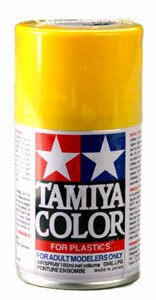 Tamiya spray paints are not affected by acrylic paints or their solvents, and so don't need a protective clear coat before applying washes or filters. Tamiya advertises that they are not affected by enamel paints either, but I would be careful using a enamels in a wash over the Tamiya. Test it out on a scrap first) . I sprayed Light Ghost Gray on a couple of aircraft models, and am using USN Insignia White as a base coat for a 1/350 Polar Lights Enterprise. In both cases, the paint produced a coating that was thin, smooth, and opaque. I observed no obscuring of detail on the surface of the models. Neither did I observe drips or runs. A note of caution: these paints are quite fragrant, and not in a healthy way. That is, ventilation is not optional. Be a wise modeler and open a window or spray outside. Also, due to the fact that these paints are solvent based, they cannot be imported into some countries (Canada being a prime example). Pricewise, the Tamiya line of spray paints is generally competitive with the more familiar Testors rattle cans, depending on where you get them (the Tamiya will cost more if you pay full MSRP). While neither is as inexpensive as the generic Wal-Mart spray bombs, the quality and ease of use (not to mention color selection) of the Tamiya paint is worth the cost. I can enthusiastically recommend these paints without reservation. Many thanks to Brian's wallet for providing the review sample. Manufacturers and retailers, interested in getting your wares reviewed and publicized on a site averaging 3500+ readers a day? Contact us! This page copyright © 2008 Starship Modeler. First posted on 28 March 2008.